The Kenmore on Pearl St.
Today it's an unassuming office building. But if the walls of the old Kenmore Hotel on Pearl Street could talk, they'd tell stories of bootleggers, big bands and gangsters. In the late 1920s, when Prohibition was in its full throes, bootlegger Jack "Legs" Diamond was part of the New York street gang called the Hudson Dusters (If the name sounds familiar, it may be because there was a bar named after them in Troy). Legs Diamond traveled up and down the Hudson quite a bit and was a frequent patron of the Kenmore's night club "The Rain-bo Room." The club was named for The Rainbow Room in NYC and had a sort of contract deal where performers would come up to Albany to play after playing in New York. Anyway, back to Legs. After spending a couple years in jail for federal charges stemming from a kidnapping in Catskill, he was put on trial in Troy for the theft of a rival bootleg truck. The day he was acquitted, he headed to the Rain-Bo Room for a celebration. It would be his last. That night he was murdered in a Dove Street boarding house. No one knows exactly who killed him, but there was suspicion that local Albany political big wig Dan O'Connell may have ordered the city police to do it. Other suspects include longtime rival Dutch Schultz and local thugs, the Oley Brothers. Diamond's wife was murdered two years later. The building's storied past has given way to a comparatively boring present. For a while The Albany College of Pharmacy used the hotel for their banquets and one of the college's fraternities, Kappa Psi Pharmaceutical Fraternity, held dances in the Rain-Bo. These days it houses offices and retail space. If you want more of the glory days of the Kenmore and characters like Legs Diamond, you're best bet is to check out "Legs" and the other novels in William Kennedy's Albany cycle. Then find a patio table with a view of The Kenmore building, order up a highball and read. After looking it up, I managed to find out that ol' Legs met his demise at 67 Dove St, to be exact! You'd think that'd be a dash of Roaring 20's gangster panache that Center Square would be loathe to have fade into obscurity, no? Nice. I love these articles on Albany's past. I've read the Kennedy book out of curiosity....when I was little my great, great aunt used to tell us stories about hanging out with her friend..."Legs" Diamond... Apparently he not only frequented Catskill, but also the little town Jess and I grew up in. I never got the sordid "adult" versions of the stories...what a shame. Thanks Kim! I was wondering about that. I walked through the place while it was vacant- what a depressing wreck. There were still some old tablecloths in the dining room, a wreck of a Victrola there too. Up in the Rain-bo room the deco velvet window drapes were clinging to the walls, the "Court of Cleopatra" mural was starting to peel off though (It's back up, though the original two story room has been cut to one) The imitation marble front had fallen off the front desk. Old papers were blowing about: 1940's vintage brochures touting the "New Kenmore", tons of registration cards (I got William Kennedy to fill one out for me) stationary from the Warner Bros. Film Exchange that was headquartered there, and form letters informing the residents that their leases were being canceled and the place was closing. There was a huge hole in the back wall- bulldozers were getting ready to start the cleanup. At least they did a good job putting back the 1930's lobby in the rebuild. It's no secret in Center Square (or Hudson-Park more accurately). William Kennedy owns it. He doesn't live there, but I've seen him there a few times. that address 67 Dove St. jumped out at me because I used to live across the street in a terrific apt. at 68 Dove...I remember once seeing (this was--ack--13 or so years ago!) WK pull out of the garage next to his brownstone..in a Jag, nonetheless. wow. my brush with Albany fame. Really? That's probably the most interesting thing I've ever heard about G-ville. I knew it was on Dove, but I didn't know which house it was. So I walked the puppy over to it yesterday evening (I'm only about a block away), and lingered for a brief moment, as someone was home and I didn't want to look like a stalker weirdo. Do you think WK sublets, or actually lives there himself part time? @Eric: that was actually really interesting. I can't quite tell from the article; is the Rain-Bo totally gone now, or are the offices and retail spaces housed elsewhere in the building? I would love to go exploring in there. Interestingly enough 67 Dove is still owned by none other than William Kennedy Jr! He doesn't live there, however. Who knew albany could be soo cool?! I got into a lot of this history when I was interning in Albany. It was 2002, and I attended Kennedy's reading/book signing of Roscoe at the Palace (it had just been released). So began my love of Albany history. I ended up doing my senior capstone project on the Albany political machine (and how it influenced journalism in this city). I named my cat after the book. Too bad my great uncle Mike isn't still around. The man ran booze for Legs Diamond. Also, was shot by a Pinkerton. In the back. During one of the strikes in Albany. My family comes from such prestige! A few years ago I had the chance to go into The Kenmore with a friend. From what I have heard, it is offices now. Sad! The first floor is amazing. The bar is beautiful, the wood looks like new and the carpeting on the floor is in good shape. There are old clocks and pictures hanging on the walls. It feels as though someone from the 20's is going to come walking down the stairs. I kept my ears open, hoping...There is a pond located further inside on the left. It has Coy fish and a waterfall, really nice. I wished that I could have gone to the upper floors, but I felt out of place. I live around the corner from the Dove Street house and every time I walk past there I think of Legs Diamond being killed there. I have read books and heard stories in different variations about his murder. There are many stories about what really happened. Does anyone know if there still is a rooming house at 67 Dove Street. Can anyone visit? if not, what is there today? @Carl, I think it's just a private residence now. You can drive by it, though. It just blends in with the other houses in the neighborhood. 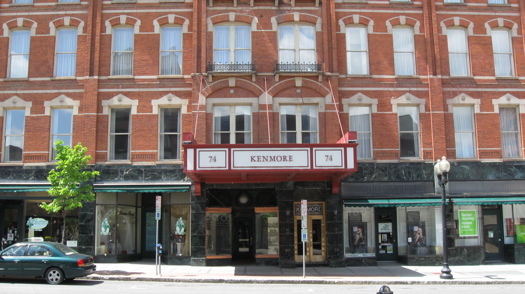 My first date with my late husband was at The Kenmore in 1957. His father, also deceased, was part of the Dan O'Connell machine. What an education I got over the next 20 years. I GREW UP AND LIVED IN TOWN DOWN ALBANY,NY (CLINTON AVE AND NORTH PEARL ST) FROM 1939 TO 1951-- A VIBRANT ,BUSY .DOWN TOWN WITH MANY INTERESTING BUILDINGS AND LANDMARKS-ALL WITHIN VERY EASY WALKING DISTANCE OF MY HOME JUST NORTH OF THE PALACE THEATRE..HERE ARE JUST A FEW OF THE MYRIAD PLACES THAT BECAME HAUNTS OF A BOY GROWING UP IN THIS FANTASTIC ERA.. 4 "FIVE AND DIME " STORES: NEWBERRY'S, WT GRANT, SS KRESKEE, AND FW WOOLWORTH... 2 MAJOR DEPTMENT STORES : WHITNEY'S AND JOHN G MYERS-- MANY GREAT EATING PLACES, HUYLERS,KEELERS,JACKS,VANDYKE TEA,THE BRASS RAIL, JACKSON'S,THE WELLINGTON,MORRIS AND WALDORF CAFETERIAS,LOMBARDI'S,PANATA'S' AND MARVELOUS OLD BLDGS :THE GRAND D & H BLDG, VAN PRYN ,LIBRARY, ALBANY SAVINGS BANK,UNION STATION, UNITED TRACTION BLDG, YMCA, ALL THE NY STATE BLDGINGS, ALBANY CITY HALL WITH A FABULOUS CAROLON ,4 MAJOR INDEPENDANT HOTELS- THE DEWITT CLINTON, THE WELLINGTON, THE TENIKE,AND THE KENMORE.. THE OLD ALBANY ACADAMY FOR BOYS,AND MANY NOOKS AND CRANIES, WITH LONG TIME HISTORIES..IT WAS A EXCITING TIME AND THRU A YOUNG BOY'S EYES IT CREATED A LIFE TIME OF MEMORIES..